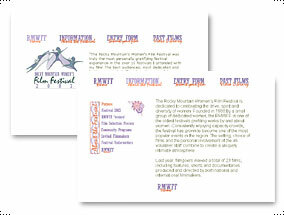 The main goal of this site was to provide information, encourage entries, and promote greater awareness of the largest women's film event in the country. To show it's commitment and support for local non-profit organizations, Laurie Anderson Design provides site maintenance at a reduced cost for RMWFF. Hosting of the organizations web site is provided free of charge as a show of support for for the organization and it's annual event.